Our house came with these terrible wood veneer doors that really just made the entire thing look dated. 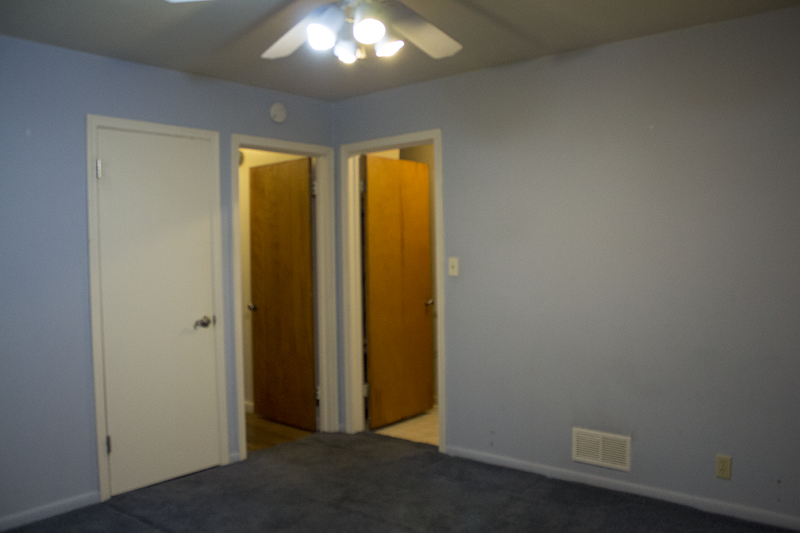 Remember when our bedroom was blue and had carpet?! Look at those ugly doors! We figured that changing out the doors in our house would be one of the easiest and least expensive changes we could make that would make a major difference in the overall look of things. Home Depot had a sale on some of their doors and we special ordered these great Craftsman style slabs and got a steal of a deal while doing it. Things were progressing nicely and after the major success of our floor we felt doors would be a piece of cake. When we ordered the doors there was an option to get them pre-hung but we figured that we would just install them into the existing door frames which would save us both effort and money. Well, the doors came in and after picking them up we quickly realized that we had a problem. 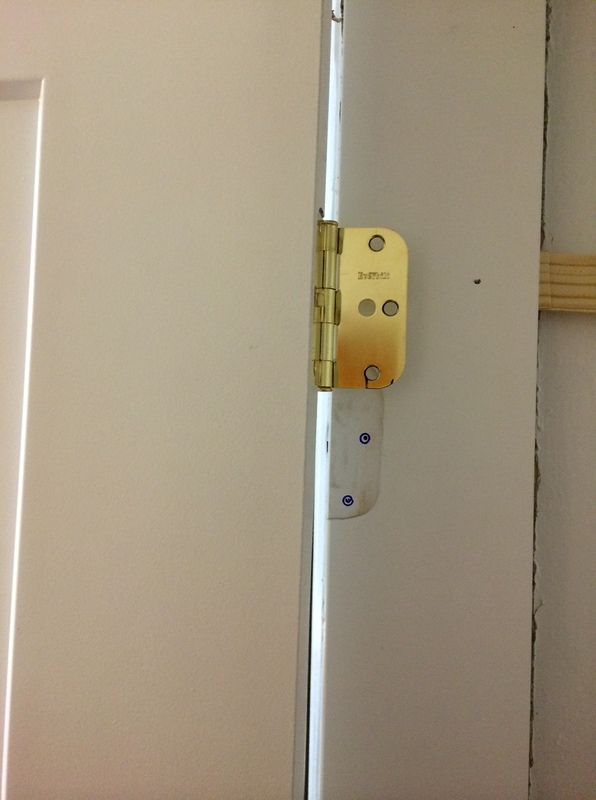 All of our existing ghetto veneer doors had their hinges hung at random different heights, and none of the door knobs were at the same height either, which meant that our standard made doors were not going to fit in the skeewhompus frames we already had—the door jamb would need to be replaced. Only mildly phased, we went back to Home Depot to order the door frames we had earlier turned down, only to be told that you can only get an assembled door frame if you get a door in it. We were then pointed to aisle 6 where they had “door frame kits” for sale. These so-called “kits” were a package of three boards wrapped together in plastic. Very helpful. But, taking this minor setback in stride we took our plastic-wrapped wood home and decided that it would be no problem. 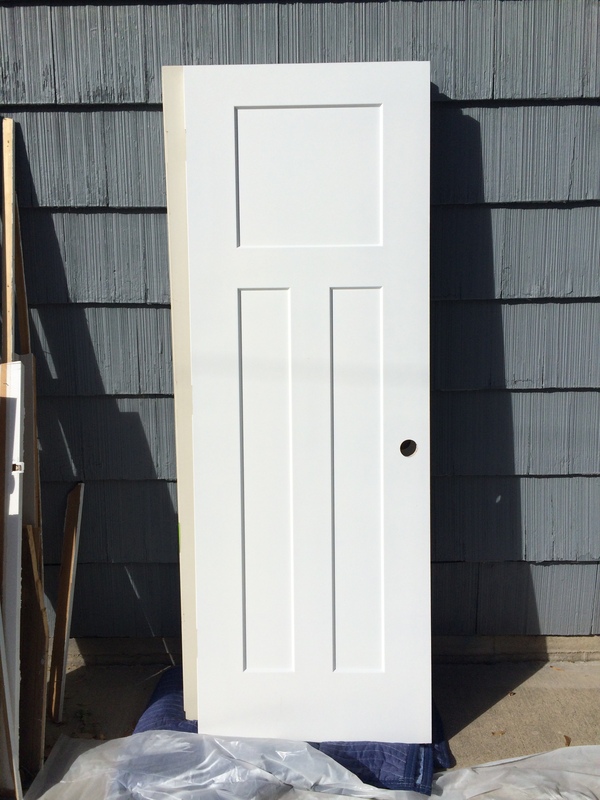 A few additional steps had been added: we needed to measure our doors, cut the frames to the right height leaving enough space around the door for clearance, rout out a place for the hinges on the frame, paint the frame, nail it together, and then level and nail it into the doorway. Cake right? 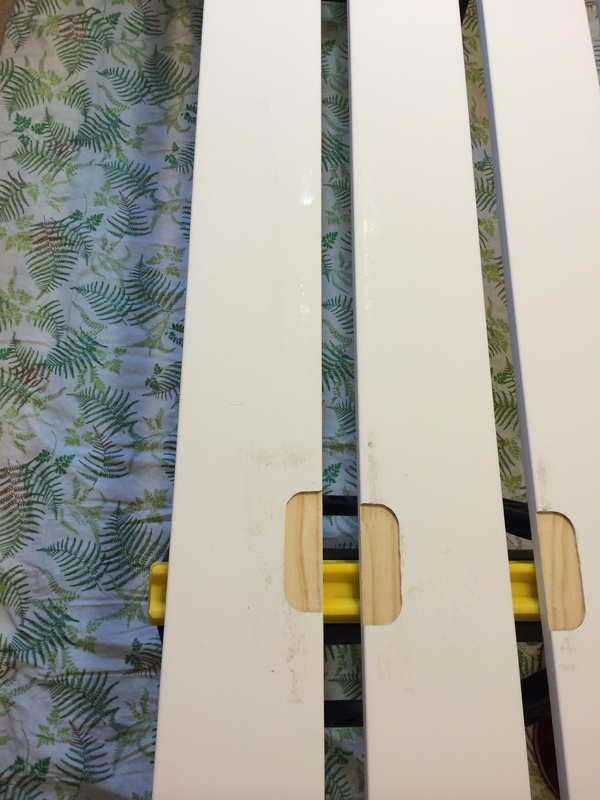 Unsurprisingly, these few simple steps took us a long time to complete, during which time we also didn’t complete our trim, because you obviously need door frames before you can put trim around a door. Currently, we still do not have trim. Well, after very careful measuring and some calculations, we finally got the boards cut to size. 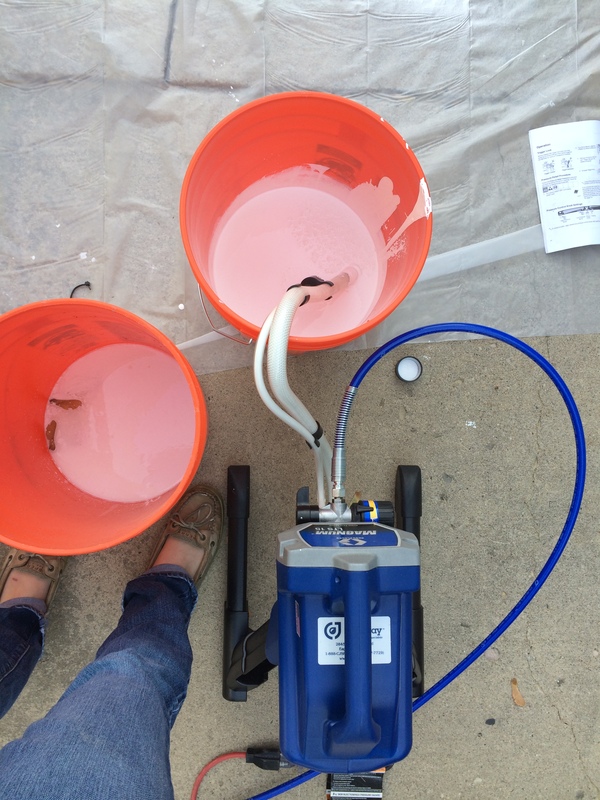 Then, using our new and very exciting paint sprayer (SO COOL!) they got a very professional looking paint job. 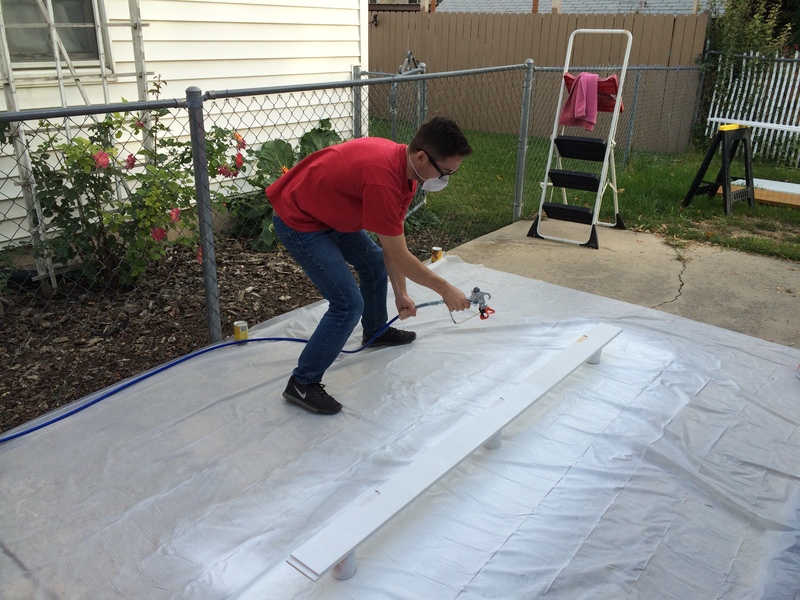 After keeping bugs out of the wet paint for a few hours, we carefully measured and marked where we would need to rout out the space for the hinges. We borrowed a router from our neighbor and worked our way through cutting each board. Routed out spaced for the hinges. Things were finally looking pretty good. The frames were pretty much complete, (with a spanking paint job) so now all we had to do was assemble them, install them levelly into the doorway, and then attach the door. We watched a bunch of youtube videos (titled How to install a door in 15 minutes or less, which is such a joke.) and set off to put these things in. We decided to start with our closet because, if it had some minor mistakes it would be the least noticeable . We figured out the nail gun. Assembled the frame. Made sure it was level and plumb by using shims and trimming the drywall, and nailed the thing in there. We screwed the hinges on the door and brought it up to be attached to the frame. And. then. this. happened. So much for careful measuring.